We have two back-to-back training camps at the Maryland Table Tennis Center starting today, Mon-Fri this week and next. So I'll be getting up early to write the blog, then off to coaching. Expect lots of interesting camp tidbits! I am not an EJ, i.e. equipment junkie. Here's my recommendation to new and intermediate players. Everyone needs to go through a stage where they essentially try everything out. This allows you to really learn and understand what's out there, and to find the best equipment for yourself. The cheapest way to do this is to ask to try out the rackets of players at your club. Eventually, you'll find the right combo, and then I recommend they stick with that, unless and until their game changes or there's a major equipment breakthrough. The latter happens about once a decade, though of course you'll read about "new breakthroughs" every year. The long national wait is over; the USA Nationals entry form is online! (Just kidding; the U.S. Open just finished a few days ago.) Here's the USA Nationals page. (Strangely, you have search around to find the dates, and even the location is in small print. Shouldn't that be in a large headline?) For once I get to drive to the tournament, about three hours away; there's going to be a massive Maryland caravan going there. See you in Virginia Beach, VA, Dec. 13-17! In my July 5 blog entry, I linked to several pictures of actor and table tennis player Adoni Maropis. In one, he was wearing rather prominent kneepads, so I jokingly wrote, "Yes, he has knee problems." Adoni responded via email, saying that he wears kneepads to dive for balls - and as someone who has battled with him on the table a number of times, I can verify that he is constantly diving for balls. He's sort of like the mountain goat of table tennis. (Oh boy, am I going to hear from him now!) He also wrote how he hates the photo I linked to about him "terrorizing the hardbat community," saying "I hate that pic...it looks like I have bad everything and either a huge beer gut or pregnant... or a woman... and oh so old." I'd comment on this, but when dealing with a guy who's blown up half the west coast and (when he's not diving on elephant-sized kneepads) kills every chance he can (at the table), I'll shut my mouth. For those who missed it, you can see all of the U.S. Open results, either in summary form or all of the results of a specific event, from preliminary round robins to the single elimination stage. "My shoulder hurts, I can't play." "Do you realize he will be adjusted to 1900?" "Hey, my shoulder feels a lot better now." U.S. Open Ratings Champions - No Fear! Under 2600: Gao YanJun (2607) over Adam Hugh (2570). Over by 7 and under by 30 points. Under 2400: Raghu Nadmichettu (2390) over Mark Croitoroo (2319). Under by 10 and 81 points. Under 2250: Klement Yeung (2239) over James Therriault (2206). Under by 11 and 44 points. I flew back to Maryland last night from the U.S. Open in Milwaukee - didn't have any coaching duties today. At the airport in Milwaukee there was a Killerspin table set up with sponge paddles and barriers! I watched for a while as parents played with kids, often "coaching" them in ways that made me squirm a bit. I debated whether to help out, but decided they were having fun, so who was I to tell them what to do? Because I had a bunch of stuff to take back to Maryland, I had two bags to check in at Airtran, which would cost $45. The attendant told me that since first-class passengers get two free bags, I could upgrade to first class for $49, and get the two bags free. So for $4 I traveled first class. The only other time I did that was nearly 20 years ago when I traveled with Andre Scott - we had regular tickets, but when they saw he was in a wheelchair, they put him in first class (for free), and since they had an open seat next to him, they gave that to me. Richard McAfee ran a nice 30-minute clinic for new players. Just before that they ran a tournament for new players, with about 50 entries. Comedian Frank Caliando did a comedic exhibition with five-time U.S. Men's Champion Sean O'Neill. Sweet Onion Chicken Teriyaki at Subway is GREAT. Had to call an umpire in a team match I was coaching because an opponent was hiding some of his serves. It's very frustrating to have to do this. (The umpire gave him a warning on the second serve he did after she went out, for holding his arm out, which is how he was hiding serves - with the arm and thrust-out shoulder. I think he did this under pressure, and probably didn't even realize it. I don't think he did this at the Nationals, the last time I saw him play.) The father of the one who was hiding his serve . . . let's just say he didn't take it very well. 'Nuff said. I landed in Milwaukee for the U.S. Open around 8AM on Wednesday, and was at the Hyatt Hotel at 8:40AM. At 8:45 I was told that the room wouldn't be available until sometime between noon and 3PM. So I hopped in a taxi and went to the USATT Paralympic training camp, which was being held in a local high school. Dan Rutenberg was the head coach, assisted by Keith Evans. I had coached one of the players, Timmy La, for much of the last year. So for two hours (9:30-11:30 AM) I helped out as a practice partner, coach, and ball-picker-upper. I believe there were 16 players, a mix of wheelchair and standing disabled. Newgy was also there for a robot demonstration, and for an hour the players took turns going through a series of robot drills on four robots. I leave for the U.S. Open in Milwaukee in just a few hours. Here are a few last-minute thoughts. I leave for the U.S. Open tomorrow morning. Since my flight out of BWI is at 7AM I'll be leaving around 4:30 AM - it's an hour away. (Guess I have to get up really early tomorrow to do my blog.) I'll try to blog about tournament while I'm there, though between coaching and playing in hardbat events, I'm not sure how many of the "big" matches I'll get to see. I'm also going to attend some USATT meetings. If you are at the Open, come by and say hello. And before you go there, make sure to get lots of sleep, eat well, and PRACTICE YOUR SERVES! 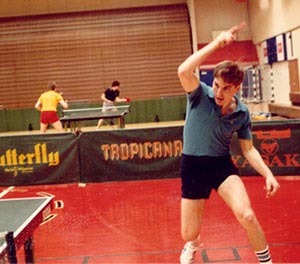 Service practice and match play are the two most important table tennis things you can do just before a tournament. On the other hand, I may have to play or coach against you, so stay up late, eat potato chips, and watch plenty of TV. About an hour ago I woke from the strangest table tennis dream possible. I grabbed a notebook and wrote it down.